In a conference room 13 miles from Paradise, California, Doug Boxer explains to survivors of the state’s worst wildfire why they should choose his law firm to sue PG&E Corp. He walks a fine line between listening to victims coping with devastation and promoting the expertise of attorneys based thousands of miles away. Under the law, he says, the dozen or so residents who’ve gathered for this meeting on a Saturday in December have two years to file a complaint. But Boxer urges them not to wait that long, implying that if they sign on now they’ll have a front seat negotiating a payout from the utility. “If we have the biggest book of cases, who is PG&E going to come to first?” says Boxer, the son of Barbara Boxer, who represented California in the U.S. Senate for 24 years. 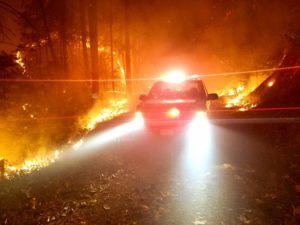 Dozens of lawyers are vying for the chance to sue the $12 billion power company, even before state investigators have determined the cause of the November blaze in Paradise that destroyed 13,972 homes and killed 86 people. Displaced residents living in shelters or temporary housing in nearby towns have found themselves inundated with legal advertising on signs, billboards, radio, television and mailers. Boxer’s firm, Washington, D.C.-based Mauro Archer & Associates, made itself stand out by enlisting as its front woman perhaps the most famous person ever to spar with PG&E – Erin Brockovich. Her success in a court case against the utility over water contamination in the 1990s inspired a movie bearing her name that won an Oscar for Julia Roberts, and in turn, helped Brockovich propel a career as an activist, author and consultant. Mauro Archer and its partner firm, San Antonio-based Watts Guerra, now count about 700 clients from the Camp Fire. That includes Kathy and David Terstegen, a couple close to retirement who figure that insurance will cover only about 50 percent of their losses from the incineration of their mobile home, which stood on a third of an acre five miles northeast of Paradise. Many homes in Paradise were underinsured or lacked coverage entirely, which can make the suits more lucrative for lawyers, who generally take a 33.3 percent cut of any uninsured recovery. Overall, insured losses from the Camp Fire stand at about $7 billion and Citigroup Inc. estimates $15 billion in gross liabilities. Suing PG&E is expensive, and there’s no doubt that firms from out of state bring deep pockets to the fight, Danko said. But based on his past experience, he’s dubious that those firms are as committed as he and his local peers are to the “grunt work” of preparing for a trial against a company fighting for its very survival. Still, he said, the distant firms can walk off with a decent payday by scooping up and settling suits on a “mass basis” to compensate for the money they’re leaving on the table. Watts Guerra co-founder Mikal Watts, a nationally prominent trial attorney, rejects the notion that he’s an opportunist seeking to profit from an area where he has no connections. His team’s website touts “a team of local professionals who live and work in the communities impacted by the fires and are deeply concerned about this recovery.” Boxer, who lives in Oakland, introduced Brockovich, who he knew through his mother, to Watts. Since the team started litigating against PG&E in the wake of the 2017 blazes that tore through the wine country north of San Francisco, Watts said he has invested $10 million preparing for cases. The expenses range from California-based arborists and forensics experts to a mobile home and an $81,000 trailer that are parked in Chico, a 25-minute drive from Paradise. “To my knowledge there are no lawyers from any other part of California that have opened a permanent office in Chico and staffed it with Butte county residents to serve the needs of the Camp Fire,” Watts said. His team also has an office in Santa Rosa to serve its 2,500 clients from the wine country fires. Brockovich said she was drawn to the D.C.-Texas team precisely because it’s invested in building a local presence. She sees herself not as a marketing magnet, but as an adviser for victims facing a “feeding frenzy” of lawyers.